Loss of ankle dorsiflexion (DF) is seen in the clinic on a daily basis. Lack of proper ankle DF can lead to compensations all the way up the kinetic chain. 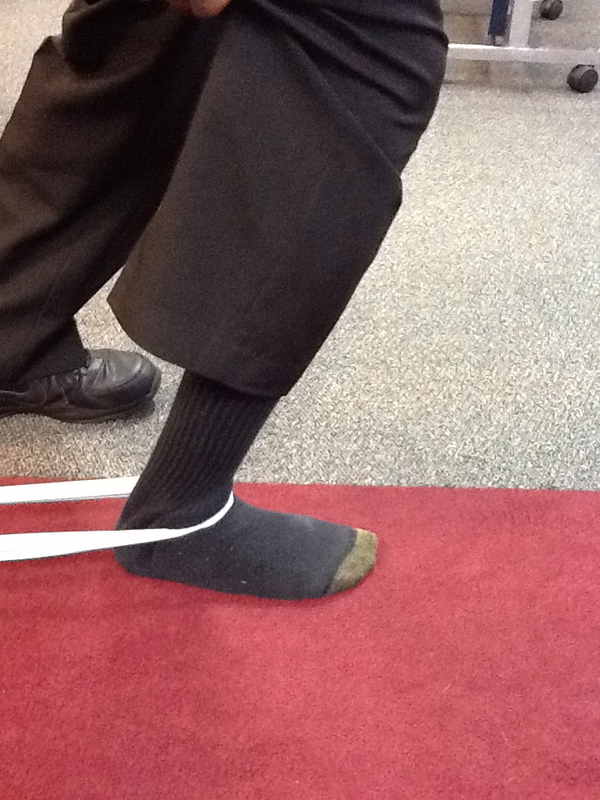 A good article to read on the importance of normal ankle mobility can be found on Eric Cressey’s web site. The primary motion of DF comes for the talocrural joint (TCJ) (the joint between the talus and the tibia). DF can become limited by decreased muscle length of the plantar flexors of the ankle and/or due to the lack mobility of the ankle joint itself (also called joint play). In order to regain normal range of motion, both of these must be addressed. The joint play that is most needed for full ankle DF at the TCJ is posterior glide of the talus on the tibia. After being mobilized in the clinic the patients need to be able to follow up at home to maintain the gains made. The following exercise addresses the muscle stretching and joint play components necessary to regain full ankle DF. It will help the patient mobilize their talus posteriorly as they are dorsiflexing, simulating the mobilization performed in the clinic. step 2: Face away from the object and place the band around the front surface of the talus. step 4: with a majority of your weight on the leg to be mobilized, perform a forward movement of your knee while keeping your entire involved foot on the ground. Step 5: Hold for 3 seconds and repeat this 30 times. Cool website! I know that foot anywhere!